Windows 10 has deep cloud hooks and shares a lot of data with Microsoft in order to create a smart, seamless experience across devices. If you lean more toward privacy, here's how to disable all of it. Updated July 19, 2017, to reflect changes based on Windows 10's Creators Update. There’s no doubt about it: Windows 10 is studded with data-tracking tidbits and hooks into all sorts of Microsoft’s online services. Handing over all that data has some tangible benefits, like Windows 10’s OneDrive integration and the Bing-powered brains behind the Cortana digital assistant, but not everyone is thrilled with the idea of an operating system that’s constantly looking over their digital shoulder. This guide will show you how to disable Windows 10’s integration, as well as provide tips on what those features actually do. That way you can decide whether you want to keep any of it active or just shut the door on it altogether. 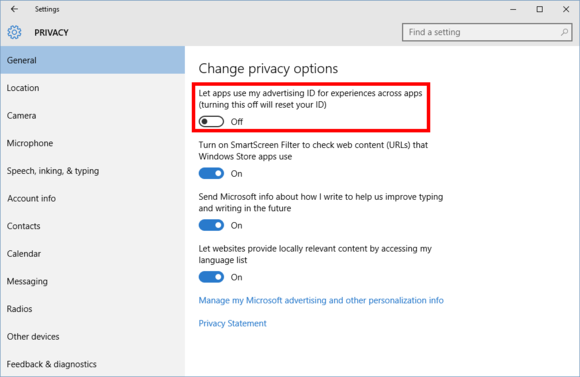 One setting you should consider disabling is all the advertising integration in Windows 10. Some of this was also present in Windows 8, but if you’re just learning about it now you might as well turn it off. Personally, I don’t mind seeing ads on websites, because that’s what pays for most of the free content we see online—including this site’s. What I do mind is “ad personalization.” I don’t need ads that are supposedly tailored to my personal tastes thanks to little cookie spies that follow my travels around the web. Generic ads targeted at a site or app’s most likely demographic are just fine by me, thanks. Tip: If you are using an ad blocker or an extension like the EFF’s Privacy Badger, you may have to turn it off for this site before you’ll see the option to turn off in-browser ad personalization. The site apparently has to set a cookie for this second option to work. Microsoft’s built-in digital assistant is incredibly useful for quickly setting reminders, calendar events, and sending email, among many other things. The information it collects is very similar to what Google does with Google Now, which you may already be using on your Android device. 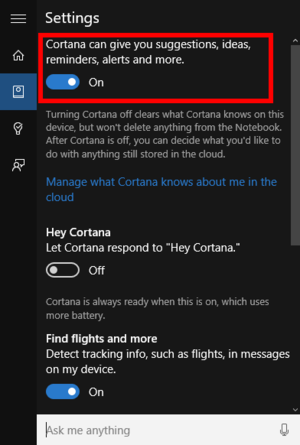 But if you’re just not into Cortana, turning it off is very simple. And if you’ve never used Cortana then don’t worry about it! It’s already off. For everyone else, click the Cortana icon in the taskbar, and then click the notebook icon on the lefthand side of the pop-up panel. Select Settings from the list of options that appear. Now, just slide the top option that says ‘Cortana can give you suggestions, ideas, reminders, alerts, and more’ to Off. Once Cortana is gone, you’ll see a new option that says ‘Search online and include web results.’ As its title suggests, this includes Bing results when you search for things on your PC. You’ll have to decide whether you want that enabled. At this time, it’s also a good idea to jump back into the Settings app’s privacy section. Open Settings and go to Privacy > Speech, inking, and typing. This is a setting that allows Cortana to gather all kinds of data about you to help it deliver services. Click the Stop getting to know me button to end that. Note that this will delete collected data stored on your PC, and it also turns off dictation functionality. 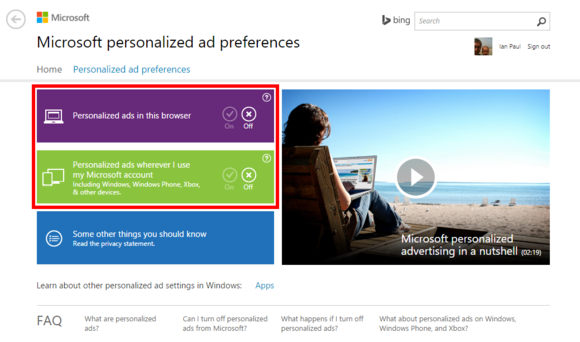 Once that’s done, click ‘Go to Bing and manage personal info for all your devices.’ This is where you can scrub any data that Microsoft has collected about you from the company’s servers. Clearing this data will affect the performance of Cortana and other personalization services across your devices and Microsoft services. You can read through this page to understand what you’re losing, or just jump to the bottom and click Clear. 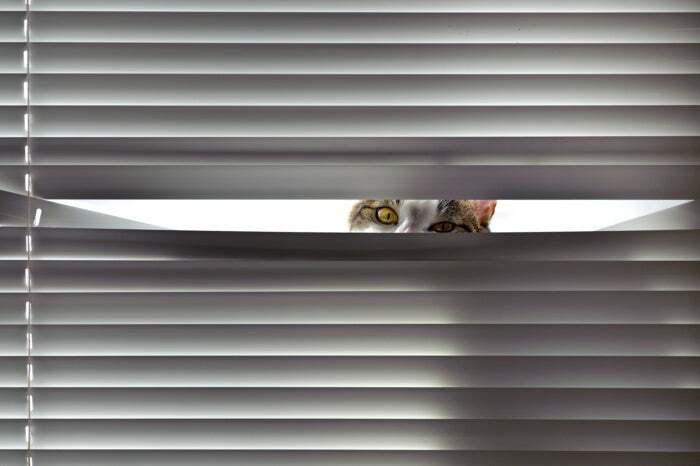 Now let’s handle two features of Windows 10 that are innovative, but also concerning to privacy-minded people. The first is Wi-Fi Sense. This is turned on by default, but it doesn’t do anything unless you explicitly use it. Wi-Fi Sense lets you share access to password-protected Wi-Fi routers. The passwords are shared silently in the background over encrypted connections. People with whom you share network access never see the actual passwords, and they cannot grant sharing permissions for their friends. The idea is that if your friends or family come over to your house, they don’t have to ask for your password. Instead, anyone who uses a Windows 10 device and is a digital friend of yours is automatically logged in. This is arguably more secure than sharing your password—once a person knows your Wi-Fi password they can easily share it with others, after all. 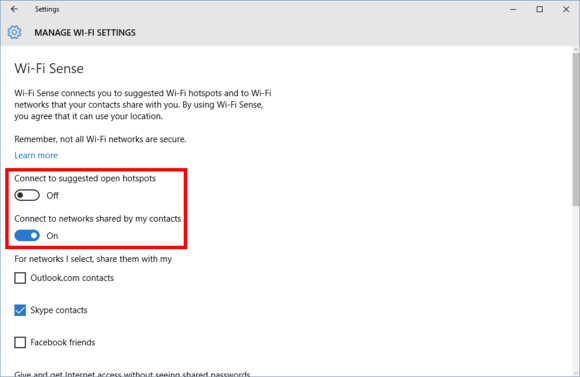 To make sure Wi-Fi Sense is off and stays off, go to Settings > Network & Internet > Wi-Fi > Manage Wi-Fi Settings. 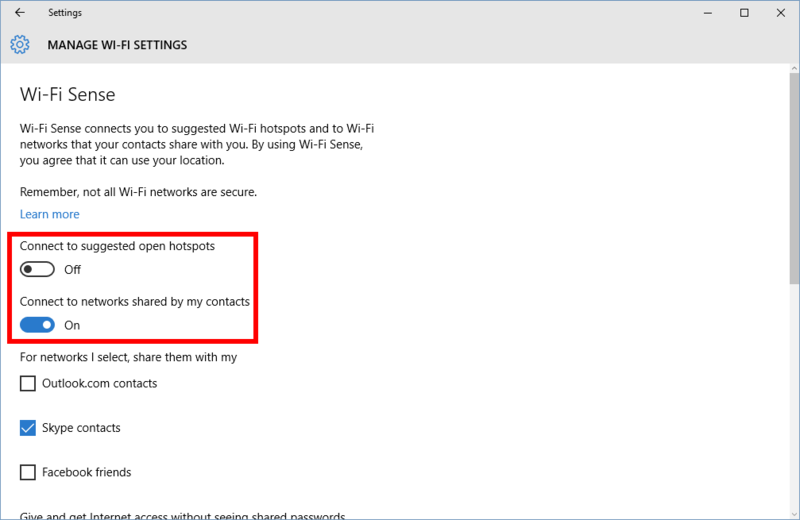 Then slide the two options that say 'Connect to suggested open hotspots' and 'Connect to open networks shared by my contacts' to Off. Moving on, Windows 10 shares system files and updates downloaded to your PC with others by default. This peer-to-peer networking feature turns you into what you might call an unwitting good Windows citizen by helping others get updates and system files faster. In return, your PC also receives update bits via other people’s PCs. It’s like using a BitTorrent client, essentially. If you don’t like the sound of that, go to Settings > Update & Security > Windows Update > Advanced options > Choose how updates are delivered. By default, 'Updates from more than one place' is enabled and set to both local sources and other PCs on the Internet. You have two additional choices, however: You can distribute updates only to PCs on your local network, or shut off the P2P updates entirely and stick to using Microsoft’s servers alone. If you want to shut off everything, just turn the slider on this screen to Off. If you want to share with PCs on your local network, leave the slider in the On position and select the radio button that says 'PCs on my local network.' For more detailed instructions, check out our primer on stopping P2P Windows 10 updates. 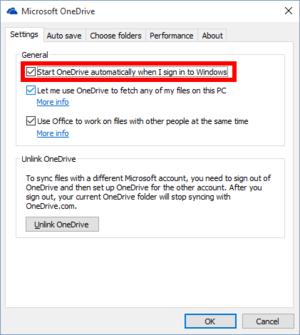 If you’re not interested in storing your files on Microsoft’s cloud servers, you can turn off OneDrive so it stops bugging you to configure it. Just click the upward-facing arrow in the system tray on the righthand side of the taskbar. 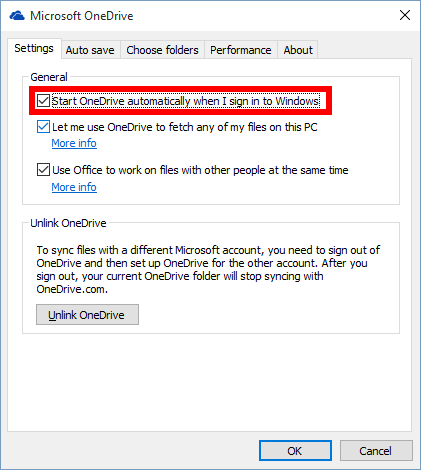 Then right-click the OneDrive icon and select Settings. Woo! Let’s take a breather. Feeling good? We’ve got the most essential parts of our privacy lockdown finished. Ready for some more? It’s time to dive into all those other privacy options in the Settings app by going to Settings > Privacy. In an upcoming section we’ll talk about SmartScreen Filter and whether you want to turn that off. After taking care of the settings under General, what you’ll mostly see in the remaining sections are methods for apps to access your data. Each panel is pretty self-explanatory. The Location section lets you control whether apps can use your location to deliver services like weather forecasts and local news. Location is a little unusual, because it can be set both on a per-device or per-user basis. 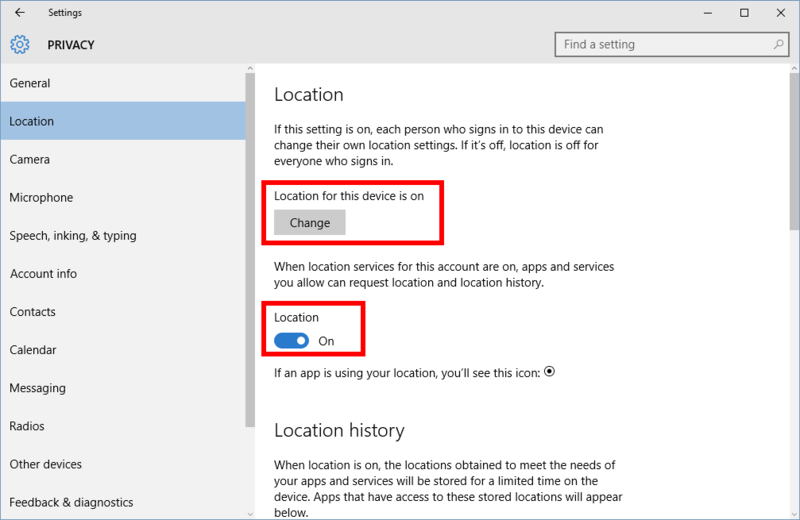 To turn off location for the whole PC, click the Change button. 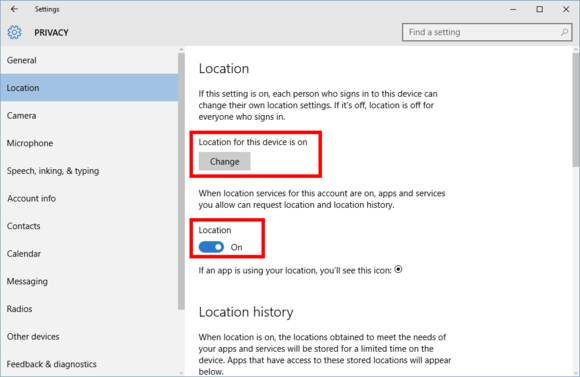 To turn it off for only the logged-in user, turn the Location slider to Off. After location is taken care of, the rest of the settings follow a similar format, allowing you to turn off access to things like your camera, microphone, contacts, and calendar on a system-wide or per-app basis. Just be careful not to let your privacy zeal impact truly useful features. The Mail app has reasonable justification for accessing your contacts, for example. Next page: The privacy reclamation continues with Microsoft Edge, various SmartScreen filters, local accounts, and more.